Brushing your teeth and flossing regularly are both effective ways of maintaining good oral hygiene. But, they cannot get every particle of food and plaque that enters your mouth. 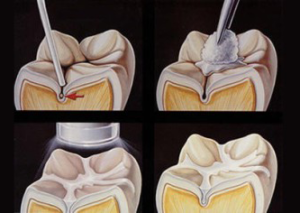 Sealants are a great and highly effective method to prevent tooth decay by simply sealing them out. A dental sealant is a thin, plastic coating that is painted over teeth to keep out unwanted particles. Sealants are most commonly applied to your back teeth, the molars, and premolars. This layer bonds into the grooves of your teeth, protecting them from tooth decay. Children and teenagers are most at risk for developing tooth decay. This makes them ideal candidates for dental sealants. Adults can also benefit from sealants though, should they not have any decay or fillings in their molars. Sealants are a thin layer applied to the tooth, but they can protect for up to 10 years. Your dentist will check them for chips or signs of wear during your regular checkups. They will suggest reapplication when necessary. Protect your teeth through prevention by contacting an appointment with a member of our experienced team at Country Isles Dental. Country Isles Dental is the premier dental practice for all of your general, family, cosmetic, and reconstructive dentistry needs. Our mission is to provide the finest comprehensive dental care program in South Florida while providing a warm and personal touch. We strive to achieve our mission with each and every one of our patients.